Kinka-who? 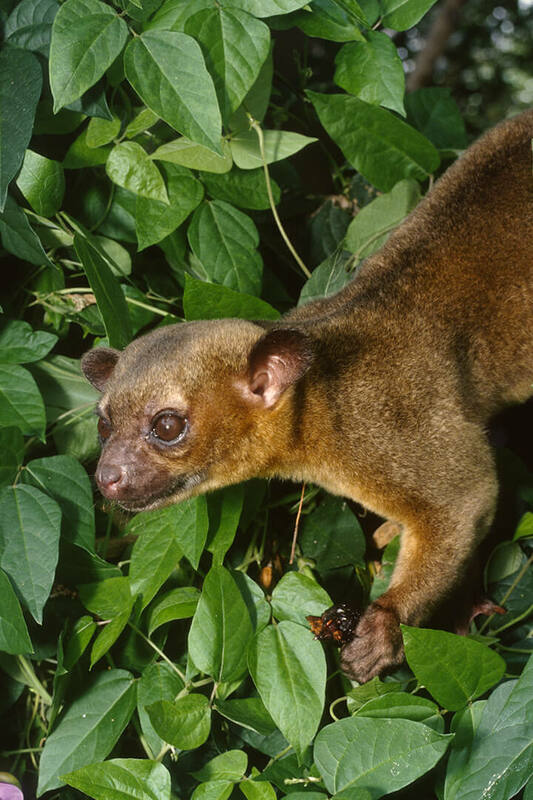 The kinkajou (pronounced KINK ah joo) lives in tropical rain forests from southern Mexico through Brazil. Its small, hand-like feet have fingers that are a bit webbed and end with sharp little claws. Dense, wooly fur acts as a raincoat to help keep the animal dry. The kinkajou’s tail is longer than its head and body and is thickly furred and slightly prehensile. The scientific name for the kinkajou is Potos flavus. 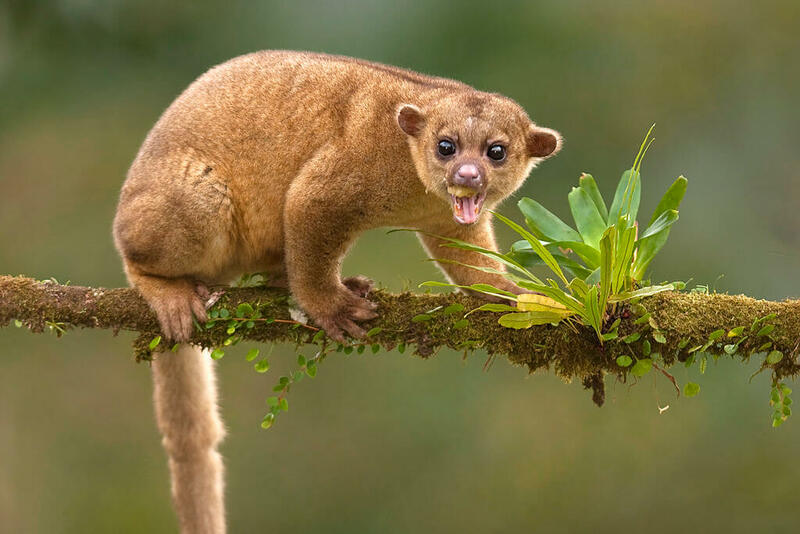 This roughly translates to golden drinker, as the kinkajou has a golden-brown coat and is fond of nectar. The common name kinkajou comes from a word that means honey bear, as this slender animal raids beehives for the golden liquid. 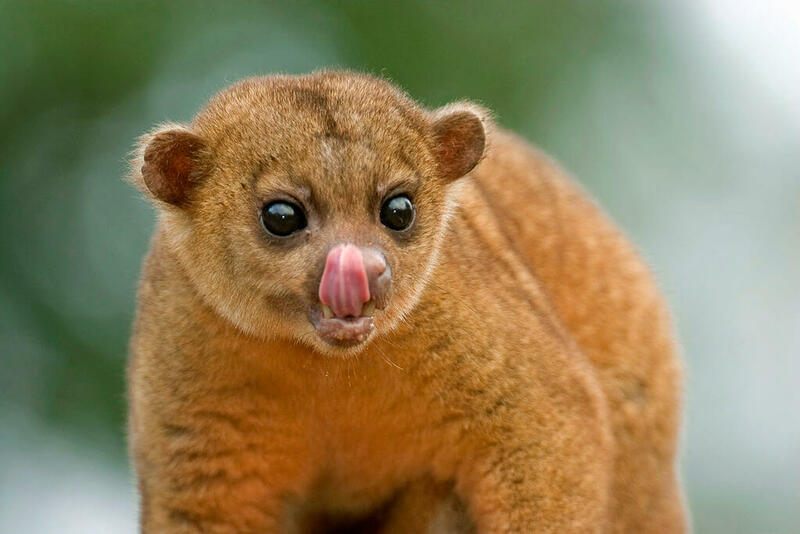 As you might have guessed, the kinkajou has quite a sweet tooth! Looking a bit like a monkey, kinkajous are often mistakenly called primates. They do have many traits and features like those of primates. But kinkajous are carnivores in the family Procyonidae, which includes raccoons, coatis, ringtails, and olingos. Kinkajous and binturongs are the only two carnivores that have a prehensile tail. The tail is for balance, to hold onto branches while reaching for food, and even to snuggle with while sleeping. Kinkajous can hang by the tip of their strong tail, then turn their body in such a way that they can climb back up their own tail! Secretive creatures of the canopy: At home in rain forests, tropical evergreen forests, some dry forests and even forests that grow in savanna regions, such as those found in Surinam, Kinkajous are arboreal and nocturnal, making them difficult to watch and study. Rather than come down from the branches high in the rain forest canopy, they travel from tree to tree via overlapping branches. During the day, kinkajous find a hollow or crook in a tree to sleep or hide in; they may use the same spot or a new one each day. Some kinkajous make nests in palm trees rather than use a tree hollow. Their spine is quite flexible, allowing them to curl into tight spots. They sleep alone or with another individual within their social group. Kinkajous come out at night to stretch and scratch before beginning their quest for food. Before sunrise, they are back to a safe resting spot. If they get too hot, kinkajous expose their belly and bare-skinned palms to catch a cooling breeze. Kinkajous are deliberate in their every movement, carefully placing all legs and the tail for the best balance. By rotating their hind ankles, kinkajous can climb down a tree’s trunk headfirst. This helps them make a quick escape from larger, tree-climbing predators such as jaguars, ocelots, and margays. There is danger from above as well, in the form of harpy eagles. Kinkajous look for dark hideaways just before dawn, the magical hour for predation. If they are not well concealed by this time, a predator might surprise them during sleep. Although kinkajous are classified as carnivores (they have canine teeth), most of their diet is fruit and nectar. On rare occasions they eat eggs, hatchlings, insects, and small vertebrates. Their 5-inch-long (13 centimeters) tongue can reach inside flowers or beehives for tasty honey or nectar. Their short, dense fur provides a natural protection from bee stings. Their dexterous paws help them manipulate food. Kinkajous often hang by their tail while reaching for their next piece of fruit! Kinkajous are important pollinators. As they travel from flower to flower to drink nectar, the flower’s pollen sticks to their face and then smears off at the next flower. Their foraging habits drive them to travel between a variety of trees each night. Several kinkajous may meet and forage together at the same site, if there is enough fruit to share! Kinkajous at the San Diego Zoo and San Diego Zoo Safari Park get dog kibble, corn, and a variety of fruit. Scientists consider kinkajous to have a “solitary group-life.” This means an individual spends most of its time alone but may join others when feeding on fruiting trees. Individuals may also gather to socialize. They play, groom, and sometimes even sleep together. A typical kinkajou social group includes two males, a female, and offspring. Whether alone or in a small group, kinkajous usually travel the same route each night and tend to stick to their own territory. Scent glands at the corner of the mouth, the throat, and the abdomen help kinkajous mark their territory. A mother kinkajou takes full responsibility for caring for her young. She gives birth to one baby (two are rare) in the hollow of a tree. This is where she leaves her baby while she looks for food. After one or two weeks, the baby's eyes open. It begins to eat solid food at eight weeks. By this time, the youngster can hang by its tail. It is able to climb with confidence when about three months old. Young males stay with their mother until they are about 18 months old; females stay until they are about two years old. Kinkajous can be quite noisy with their high-pitched squeaks, hisses, and barks. They screech and bark all around the forest, earning them yet another nickname: la llorona, Spanish for the crying woman. San Diego Zoo Global has had kinkajous in its collection on and off since the 1920s. Today, the San Diego Zoo and San Diego Zoo Safari Park each have a kinkajou. The Zoo’s kinkajou serves as an animal ambassador, meeting Zoo guests up close during special programs as a representative of disappearing rain forests. Although kinkajous are not an endangered species, poachers hunt them for fur and meat or for the exotic pet trade, threatening their numbers. Because they are wild animals, kinkajous do not make good pets, no matter how cute you might think they are! Kinkajous have a painful bite and can be destructive to a home in the middle of the night, when they are most active. In Belize, kinkajous are called "night walkers." A kinkajou's hearing is sharp enough to detect the movement of a snake. Kinkajous are able to turn their feet in the opposite direction and run backward just as quickly as they run forward. This also makes it easy for them to climb up and down trees headfirst.